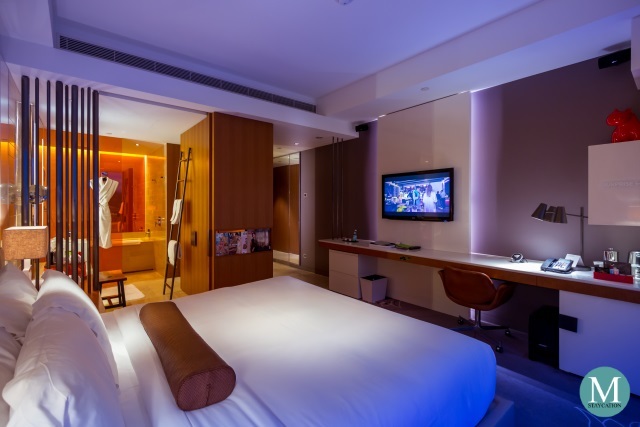 The Wonderful Room is the lead-in guestroom category of W Taipei (台北 W 飯店). 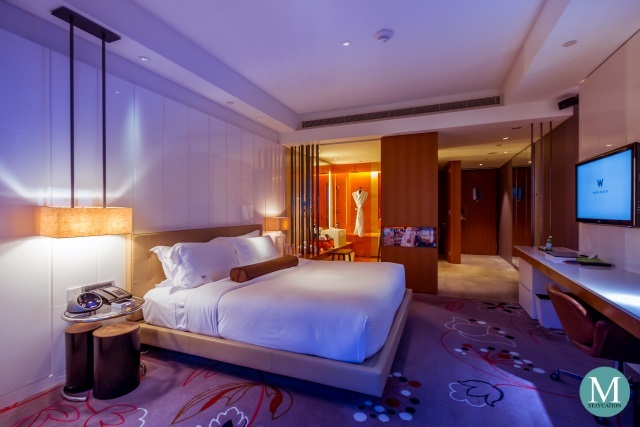 With an average floor area of 43 square meters, the Wonderful Room at W Taipei is one of the most spacious among the entry level guestrooms of Taipei's international luxury hotel brands. 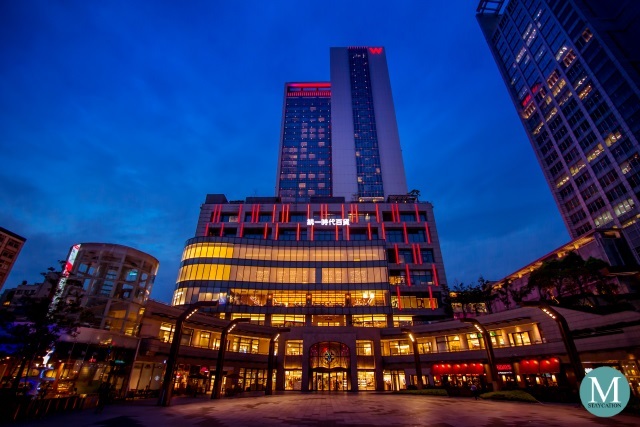 Consistent with the luxury and design-led lifestyle hotel concept of the W Hotels brand, the Wonderful Room at W Taipei combines cutting-edge design and local influences, which give it its own personality and destination identity, while keeping true to the contemporary luxury feel of W Hotels. 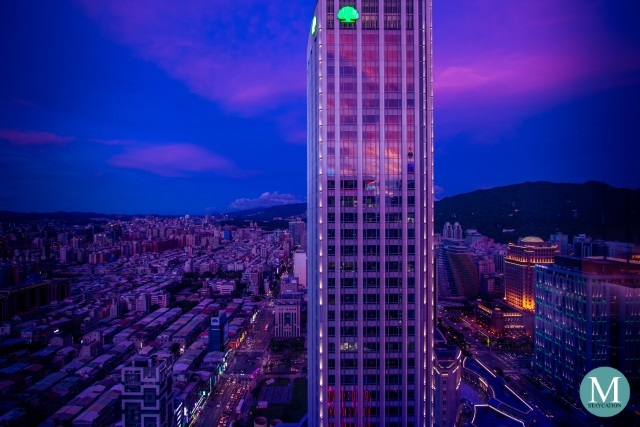 The Wonderful Room at W Taipei is inspired by the bustling and vibrant neighborhood of the Xinyi central business district and by the natural serenity of the nearby Qixing Mountain and Yangmingshan National Park. Elegant marble tile flooring, burnished wood, and lush electrified floral carpeting are beautifully blended with cubist white cupboards, state-of-the-art entertainment amenities, and with pop of bright colors that bring super-charged energy into the living space. 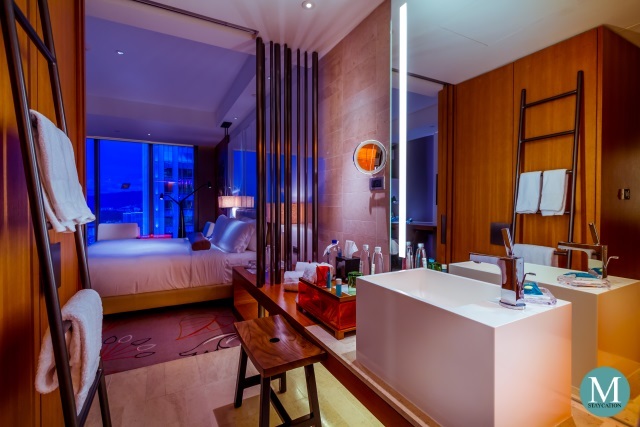 The Wonderful Room at W Taipei presents a well balanced style and substance wherein emphasis is given on comfort, attentive service and exceptional amenities. This can seen from the biggest details of the room's design to the smallest details of the room amenities. The centerpiece of comfort of all W Hotels guestrooms and suites is the W Bed featuring a pocketed coil mattress covered with a 400-thread count 100% cotton sheet and topped with white goose down duvet, and finally coupled with feather and down pillows. 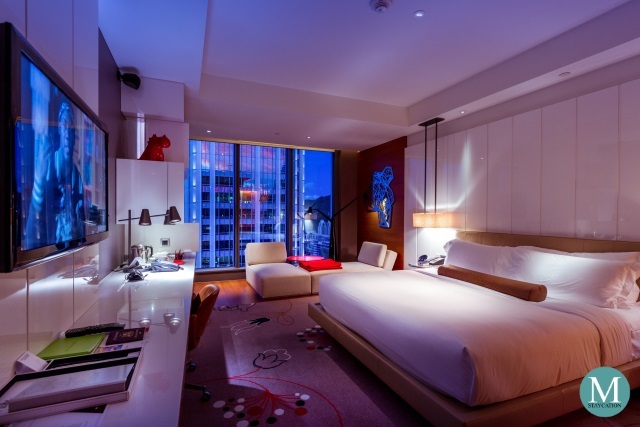 If you have stayed in a W Hotel before, you can expect the same ultra-comfortable sleep at W Taipei. 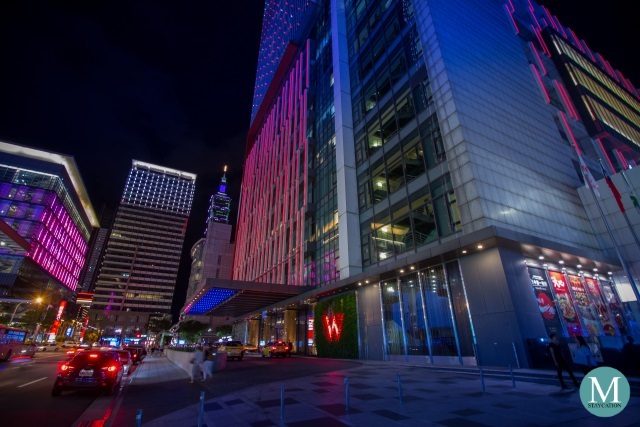 If this is your first time to stay in a W Hotel, the W Bed will be one of your main reasons for staying in a W Hotel again. 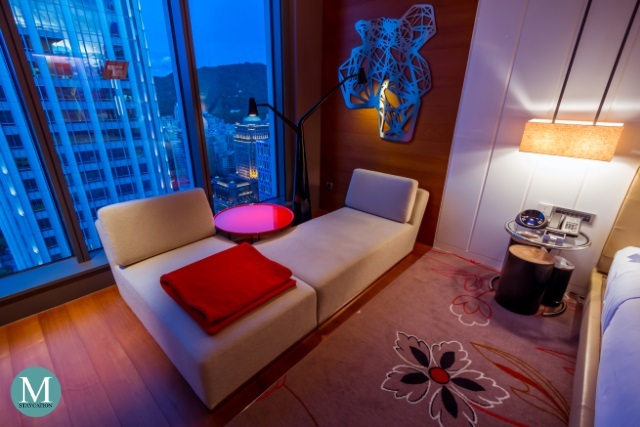 The Wonderful Room at W Taipei also features an indoor terrace furnished with chill loungers, a coffee table and a tree light. 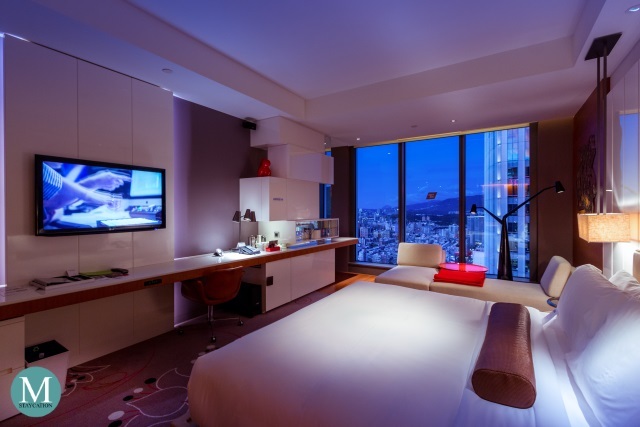 The floor-to-ceiling glass wall offers a sweeping view of cosmopolitan Taipei. For privacy, sheer shades and block out blinds can be drawn down using the controls conveniently located next to the bed. A unique feature of the Wonderful Room at W Taipei is the Mixologist Laboratory with glass rack. This is an innovative in-room amenity with which guests can mix their own cocktails right at the comfort and privacy of their room. Each Wonderful Room is provided with a cocktail shaker and an ice bucket. 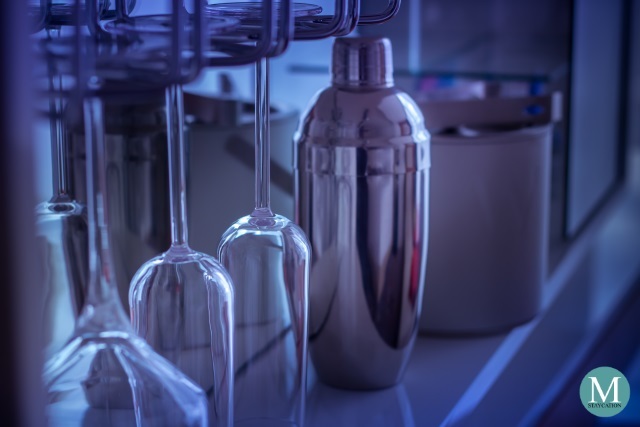 The glass rack has four cocktail glasses, perfect for entertaining a small group of friends. 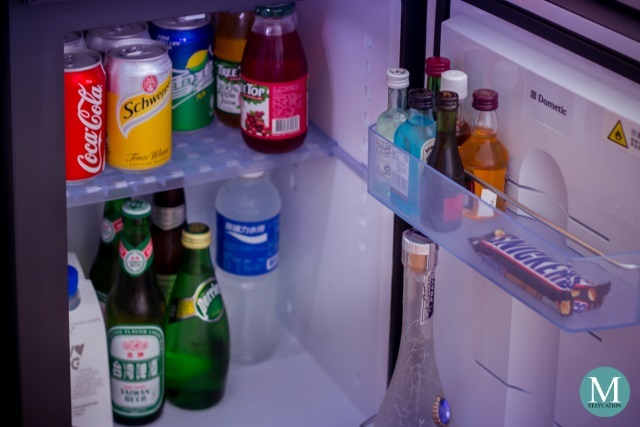 Spirits (gin, vodka or rum) as well as mixers (soda and juice) are available inside the minibar (called W MixBar). Ready-to-mix cocktails are also placed inside the Mixologist Laboratory complete with preparation instructions. If you need ice, just call guest services and ice will be delivered to your room in no time. 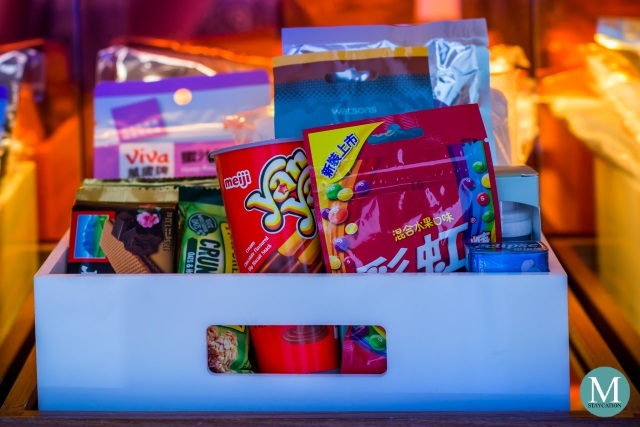 The cubist white cupboard also stores the Munchie Box which contains snack items as well as W Hotels souvenir items such as polo shirt and cap. I also saw items such as mints, lip balm, even fishnet tights. 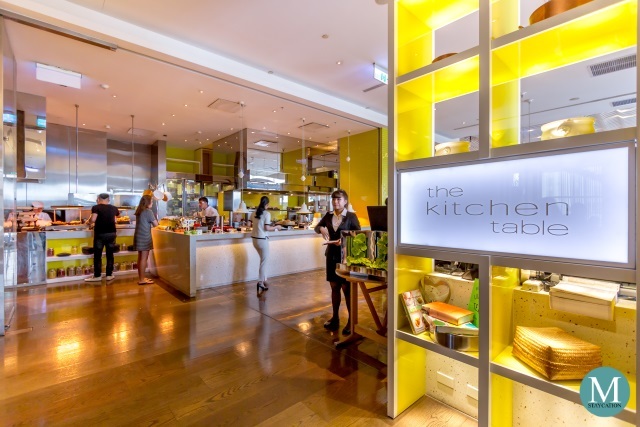 There's an electronic kettle and french press which guests can use to prepare coffee or tea. 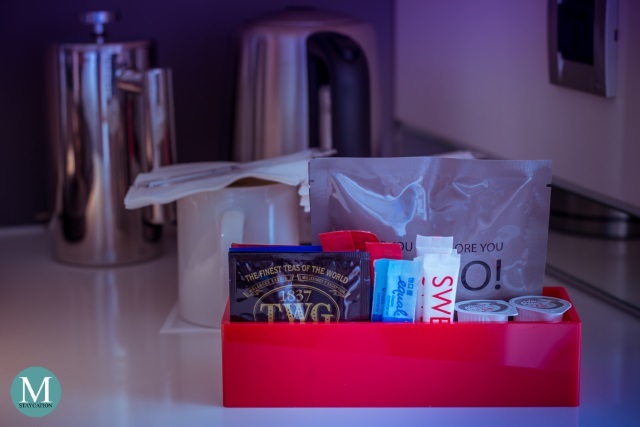 Complimentary ground coffee and TWG branded tea bags, as well as sugar, artificial sweetener and milk are placed next to the coffee and tea making facility. Complimentary bottled water are placed next to the bed. 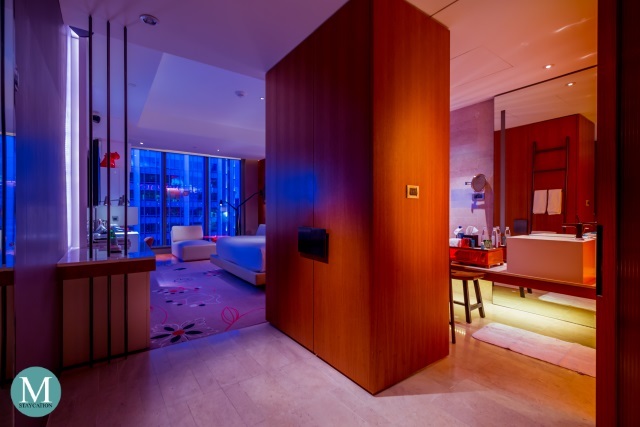 With the international jet-setters in mind, the Wonderful Room at W Taipei has got you covered whether you are a leisure traveler, a staycationista or a yuppie on a business trip to Taipei. Complimentary high-speed wired and wireless Internet access is available inside the room so you can stay connected to update your social media accounts or catch up on work. I spent a couple of hours using my laptop on the modern white work station to edit some photos I took during my visit to Taipei. The leather ergonomic chair gives a relaxing lounge ambiance. Business travelers won't feel that they are actually working. 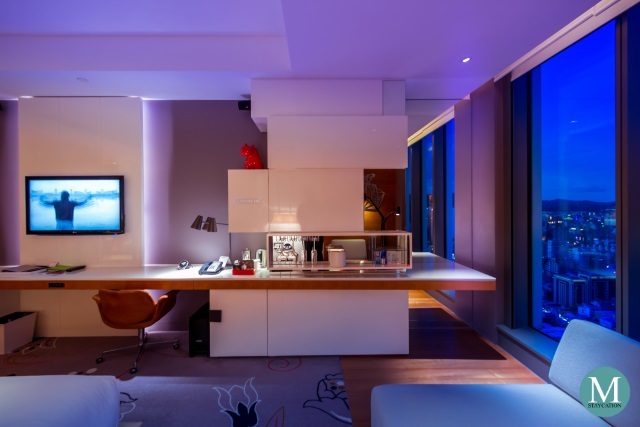 The Wonderful Room at W Taipei is equipped with a 42-inch LG flat-screen LCD television with a Bose 2.1 Sound System. International and local satellite channels are available. The room has incredible sound proofing that I didn't hear noise from adjacent rooms, so feel free to enjoy the sound system. Conveniently located next to the bed are the switches to the in-room lights and the blinds. Power outlets with universal sockets are also found around the room. There's even a USB power outlet. 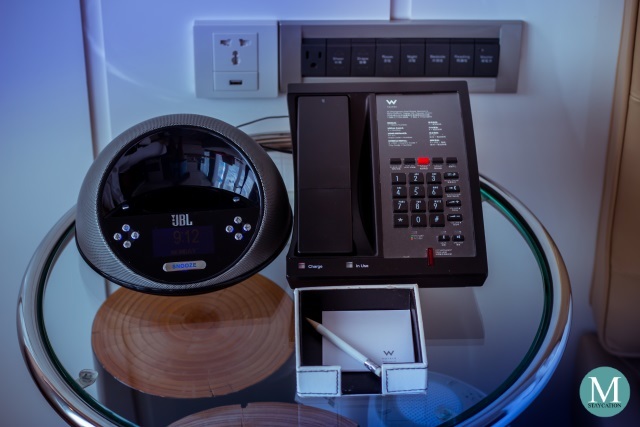 If you prefer to listen to your own music or set the mood inside the room, you can connect your mobile device to the JBL on Time Micro dock. The closet separates the sleeping area and the bathroom. It has enough storage space for short stays. A foldable luggage rack is also provided so you don't have to store your luggage inside the closet. 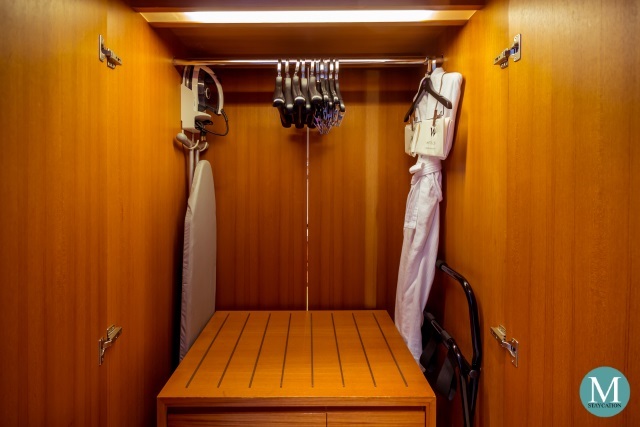 The closet also houses an electronic safe, an iron and an ironing board. The water closet is located outside the bathroom area. It has its own door and is equipped with a smart toilet. These Japanese toilet seats are a standard feature in most luxury hotels in Taipei. It has an automatic motion-sensor cover and warm-water cleaning and drying functions controlled by a wireless toilet control panel. The glass sliding door next to the water closet leads to the main bathroom. Opposite the glass sliding door is a full length tri-fold-mirror. The bathroom has a single basin with hot and cold water flowing from the faucet. Another sliding door located next to the bed opens up to the bathroom, making it accessible weather you are coming from your room's main door or from the sleeping area. Note that the sliding doors do not have locks and the side facing the bed is not complete covered. Having said this, the Wonderful Room is ideal for couples or solo travelers. 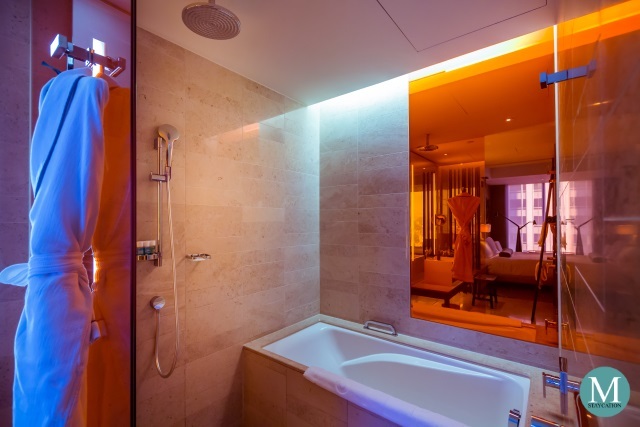 I personally love the retro orange theme of the bathroom which is a stark contrast to the shades of blue, purple and magenta city lights that illuminate the bedroom. The use of marbles and wood also extends to the bathroom, most notable are the wooden stool and the ladder that serves as towel hangers. The separate shower and bathtub are collocated in the same area of the bathroom making it convenient to switch from shower to bath and back to shower. 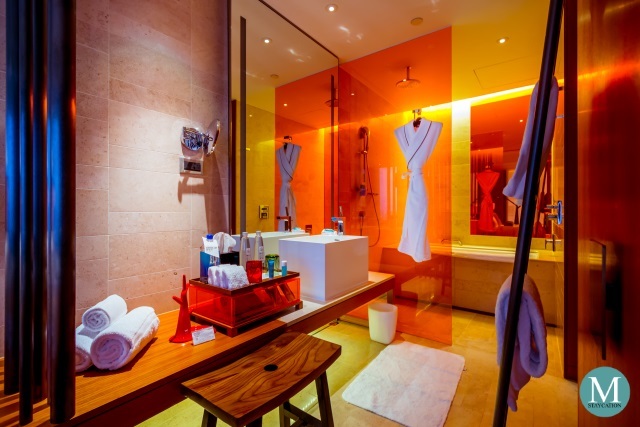 High quality towels and bath robes are conveniently placed near the shower area. I particularly enjoyed the rainfall shower. 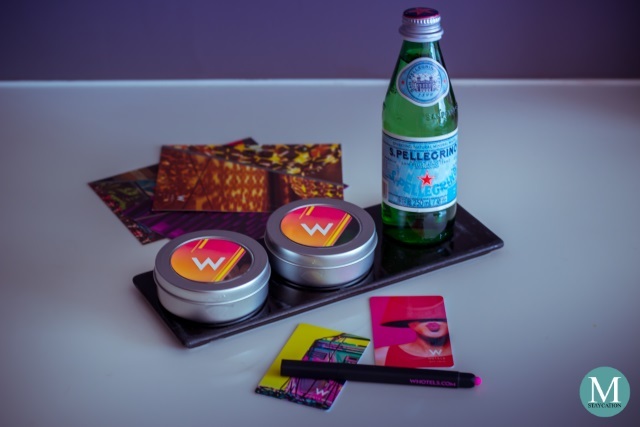 As a global standard, guests staying in a W Hotel are provided with Bliss Lemon + Sage bath and body amenities. 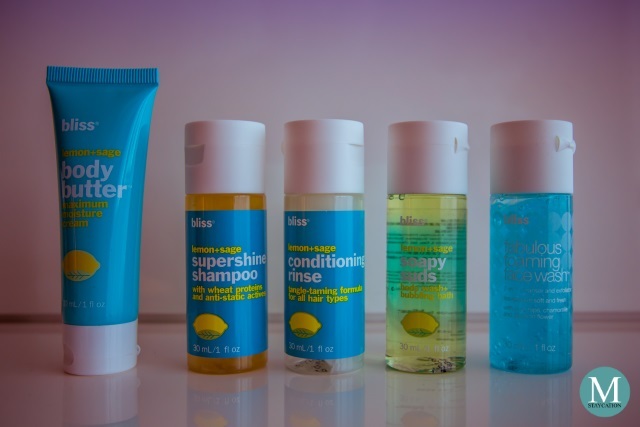 While most hotels would provide you with shampoo, conditioner, shower gel, body lotion and soap (not in the photo), W Hotels adds a foaming face wash to its amenity set.